Not every artist is suited to catalogue raisonn treatment, but the oeuvre of Ed Ruscha, comprised as it is of series, repetitions and documentations, looks great under such clerical scrutiny. 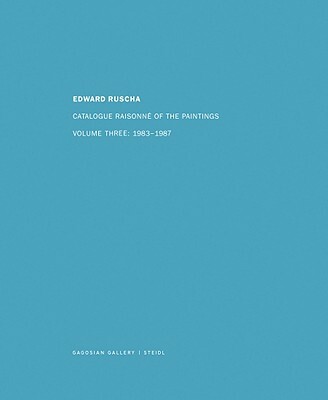 Projected as a seven-volume edition under the guidance of Robert Dean and Lisa Turvey, the Ruscha Catalogue Raisonn Project lends the serial quality of Ruscha's early artist's books to the entire body of his work, while providing a definitive resource for fans, scholars and collectors in the most efficient style possible. The three previous volumes collected works from 1958-1970, 1971-1982 and 1983-1987. Such esteemed artists and critics as Walter Hopps, Lawrence Weiner, Dave Hickey, Peter Wollen and Yves-Alain Bois have contributed essays celebrating and reviewing Ruscha's steadily incremental accomplishment. Each volume of the catalogue has a stitched binding and a cloth cover with silver-colored embossing, protected with an embossed slipcase. Volume 4 is a co-publication of Gagosian Gallery and Steidl and documents 198 paintings from 1988 to 1992. In addition to almost 200 color reproductions, it includes a comprehensive exhibition history, bibliography and biographical chronology, as well as a text by artist Mel Bochner and an essay by art historian Briony Fer.